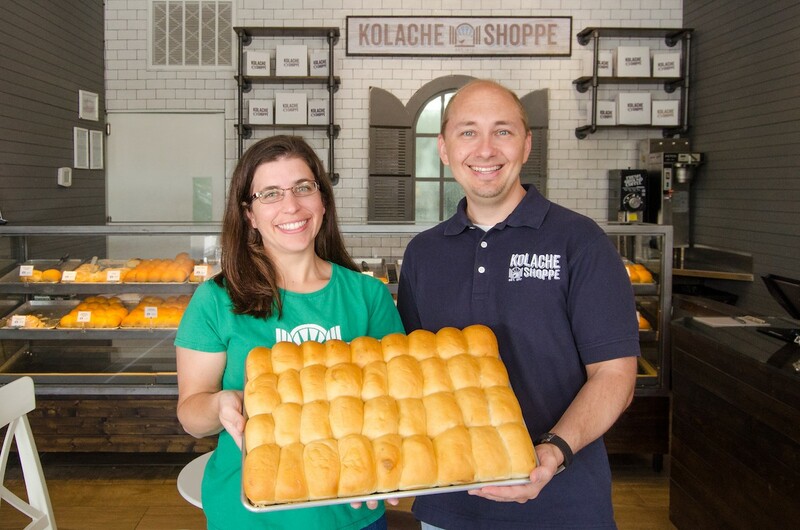 Lucy and Randy Hines, the Kolache Shoppe owners, will oversee the expansion to a second location. Photo courtesy of Kolache Shoppe . Family-owned and operated Kolache Shoppe is headed to the Heights in summer 2018. Planned for a new, 1,200 square-foot space at at 1050 Yale, the company’s second location will serve as both a bakery and coffee shop under the management of owners Lucy and Randy Hines. Using Czech recipes, the Kolache Shoppe makes traditional kolache with dough made from scratch, filled with sweet fruit and cheese. The company also sells klobasniky—savory meat in sweet kolache dough—with Texas flair, including a customer favorite filled with slow-smoked, prime-grade brisket called The Grateful Bread Brisket. Like the current location at 3945 Richmond, the space at the Heights Central Station will offer Boomtown Coffee, but plans to also include espresso-based drinks and cold brew in addition to the drip coffee currently on offer. Those on the go will have the option to use a drive-through service at the new space, in a nod to the area’s younger, active residents.